Maybe you have been to the "Look Out" monster thread at CoffeeGeek and wondered how to make those amazing-looking extractions. In this article I describe my own process and give tips about how you might improve your extractions. Before describing the process I must say that it all starts with the beans. Without great beans you'll get poor results even if you have perfect technique. Use high-quality beans roasted within a week or two. My preferred roast is deep brown in color with no visible surface oil. LOAD your fresh beans into the grinder. Don't worry about a precise measurement, we'll adjust the dose later. My scoop is 30 ml, and three scoops produces a little extra ground coffee for a triple. 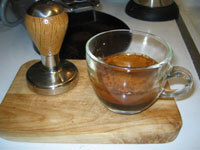 GRIND + DOSE: I start dosing into my portafilter while the grinder is running to minimize clumping. MID-TAMP: Not really a "tamp", it's a technique to level the dose as you fill the basket. The plastic widget on the front of the Mazzer (or a small tamper) can be used to lightly mush the grounds into the bottom edges of the basket for better distribution. Distribution in the triple basket can be problematic. Often the dose ends up heavier in the middle and lighter at the edges (causing uneven extractions). After trying the mid-tamp, my extractions became more consistent. The most common sign that the distribution needs work is a "donut" or lopsided extraction. You'll see very little flow from some area of the basket (usually the center) and the edge blondes early. For ristretto this is more pronounced and will make a shot that tastes earthy rather than sweet. PATTING/LEVELING: After overfilling the basket, I use a finger to lightly pat the coffee into the basket so it's level with the rim. Make sure the density is even by filling in any "weak" or "light" areas. Wipe the excess away. I dose by volume and not weight, so I had to develop a "feel" for how firmly to pat the coffee. This determines my dose. In the next step we'll tamp. After a few repetitions I found how firmly I need to pat the coffee (and you will too). TAMP: Tamp at 30-40 pounds. Use the NSEW method (tamp lightly at the "four corners") before firmly tamping the middle, then final light tamp with a twist to polish. This works for me, but feel free to develop any consistent style that works for you. REMEMBER: Tamp to create a solid puck with a good side seal. The side seal is especially critical for pulling ristretto so you can pull at higher pressure without side channeling. ALSO: Don't let the puck shift in the basket as you tamp. If that happens then it's best to start over (I speak from experience). If you lose your side seal the extraction will blonde almost instantly on the edges adding bitterness to your cup. After tamping there should be enough room above the puck (called "headspace") so that the puck isn't touched when the portafilter is locked in. It's important that the puck surface remains intact. If it gets damaged then the brewing water will make channels. FLUSH: Flushing applies to heat exchanger style espresso machines. In my opinion ristretto tastes better when pulled at slightly cooler temperatures, so flush extra before a ristretto, immediately before you lock the portafilter and brew. Brewing temperature rises in HX espresso machines when running ristretto due to slow flow through the heat exchanger. If the starting temperature is high then the cup will have "burnt edges" in both appearance and in taste. Ideal temperature for extractions depends on your beans. I prefer roasts that are deep brown with no visible oils after 3 days of rest; and my routine starts the pull at about 202°F. BREW: It's OK if it takes a few extra seconds for the shot to start dripping. I'm pleased if extraction goes more than 25 seconds and less than a minute before blonding. No matter what, stop the brew when the stream starts to get thinner and lighter in color. Blonding causes bitterness in the cup, and can also affect the body and mouthfeel of the drink (it will get thin and watery). ADJUST: I adjust my grinder after every session. Even if everything went fine today, my beans will be a day older tomorrow so I adjust very slightly finer. Remember to use fresh beans. Be especially careful about your dose, distribution, and tamp. Hopefully the extra steps of the mid-tamp and patting/leveling will help improve your consistency. The triple ristretto can have an extra measure sweet-thickness making a very syrupy shot if everything is right. Certain blends lend themselves to this kind of extraction better than others: Yemen makes a lovely and smooth ristretto but brighter blends get spicy and leave a strong "twangy" aftertaste just behind the tongue. This is a guide to the tweaks I make for ristretto. My strategy is to raise the brewing pressure limit to be able to make pulls with higher pressure and longer extraction times. I then use a variety of techniques to get an even extraction. Increase the Pressure: I set my espresso machine's maximum brewing pressure up from 9 bar to 10 bar by adjusting the over-pressure valve (OPV, also sometimes called an expansion valve). Machines with rotary pumps have an adjustment on the pump. Some blends respond well to higher-pressure extraction. I especially love the Espresso Delight Blend from Mitalena Coffee as ristretto (the thicker I can draw a shot, the sweeter and more chocolaty it gets). I find that you can get a syrupy body and sweeter taste that lingers in the middle of the palate when pulling at higher pressure. More Time: "Tighten" the grind so that first droplets take extra time to appear. I like to see first drops at 10-12 seconds. It's OK to let a shot run 40 seconds (or longer) for that 1.5 ounces of joy. I let my taste be my guide rather than the stopwatch. NOTE: When you tighten the grind you will need extra special care when tamping because channeling is much more likely to happen when operating at higher pressure. Tamping Force: I tamp at 40+ pounds. Be careful when pressing down this hard. If you twist or shift the puck you will damage the side seal. Remember that ristretto requires extra-good side sealing to prevent edge channeling. Headspace: Use a little less coffee in the basket to get some extra headspace. When working at higher pressures headspace promotes an even extraction by developing a "pressure cushion" above the puck. This can only work if you have a good side seal so the water can't find an easy path around the puck. 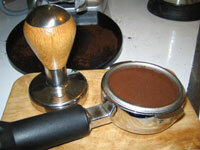 Extra headspace helps by allowing you to grind finer to get a slower extraction without overextracting or channeling. If part of the stream goes blonde prematurely, or if you start getting "jets" from channeling then the shot needs to be stopped. These are telltale signs that the distribution and tamp needs work. If you can get a 45 second triple that produces less than two ounces with no blonding then chances are you're THERE and the shot will be as sweet and thick as you could ever imagine. The conventional wisdom says you pull two ounces in 25 seconds from 14 grams of ground coffee, so the triple ristretto goes against the conventional wisdom. That's OK as long as the cup is yummy!